Top-of-the-line, consumer grade video camcorder the Vixia, HF G10 packs plenty of professional features into a 1.2 lb camera. 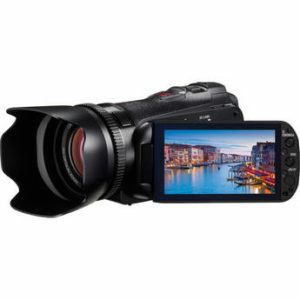 If you’re looking for a small, lightweight video camera that packs a lot of professional features and capacity into a camcorder that’s easy to use and reasonably priced, then definitely look at the Canon Vixia HF G10. The HF G10 records on a 32GB internal flash drive and gives you additional recording and storage capacity by including the dual SDXC-compatible card slots. If you make use of all this, the HF g10 delivers exceptional storage capacity of up to 2 TB. Two memory card slots as well as a 32 gig internal memory gives the HF G10 enormous capacity for storing video. The VIXIA HF G10 allows you to record up to 12 hours of clear high definition video to a 32GB internal flash drive or to two SDXC-compatible memory card slots. With “Relay Recording,” the camcorder automatically switches video recording from the internal drive to the SD memory cards when the memory becomes full. No need to stay awake! 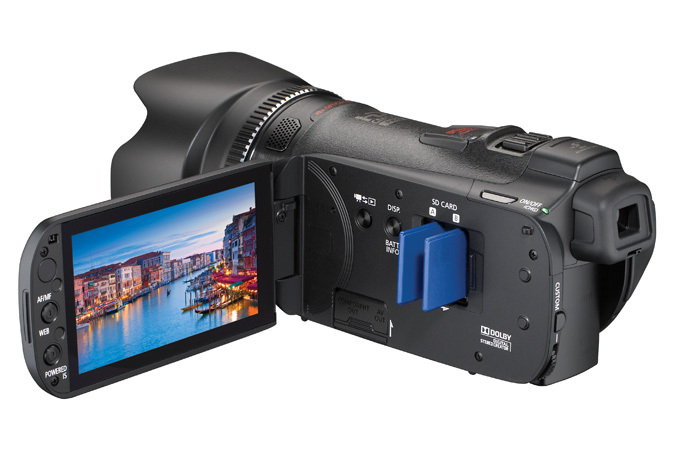 To buy the Canon Vixia HF G10 click here. Let me hear you speak! As with all Vixia camcorders, Canon was smart enough to include a microphone input and headphone jack. 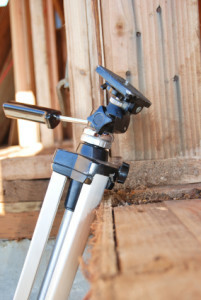 This lets you plug in a second microphone to get quality audio of someone speaking. This feature alone helps set the entire line of Canon Vixias apart as superior in the consumer grade video camera market. In keeping with the demands of the market wanting a professional look and full creative control on a budget, Canon gives the user options like native 24p recording, Cinema-Look filters, and full manual control. People have come to rely on image stabilization and although I am a fan of old fashioned tripods, it is absolutely good to have quality image stabilization for those times when a tripod slows you down. The VIXIA HF G10 features Canon’s proprietary Dynamic SuperRange Optical Image Stabilization which utilizes continuous adjustment throughout the entire zoom range, which is meant to correct a broad range of unwanted motion on both the wide and telephoto lens settings. Another quite revolutionary feature with this camcorder is the fact that the viewfinder is a touch panel control. Canon advertises this as speeding up and simplifying navigation. The touch screen also is used for a focusing feature they call Touch & Track, which allows you to get precise focus and exposure on any subject by selecting your choice right on the Touch Panel LCD. Now that is simply amazing IMHO! Dimensions (W x H x D) 3.0 x 3.1 x 5.9-inch (77 x 78 x 151mm). Excluding lens hood and grip belt. * Recording time based on internal flash memory only. Greater capacity is possible when SD memory cards are also used (2 card slots). What is the meaning of Video Recording system MPEG4-AVC / H.264, and what is the advantages, and in which sony models is available. MPEG4-AVC is the name of the video file format used to record the video. It is considered one of the better, more versatile formats today. It’s quite common and if you had to pick one “best” video file format, most people would vote for this one. It’s going to be in lots of Sony camcorders. I just did some quick looking at B&H Photo, and all 3 Sony cameras I looked at recorded in MPEG-AVC/H.264. When you’re researching cameras, look at the spec for video format. I hope this helps!